Every living soul belongs to God. (Ez 18:4). Man and animal, saint and sinner all belong to God. My brief span on earth, is my God given opportunity to recognise this. I can choose to ignore this fact to my peril, or I can choose to honor it. 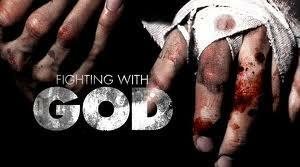 I can choose to wrestle with God or walk with God. It is commonplace to ignore God and His attempts to gain my attention. Jacob had led a life well, but painfully without God. Finally on God's second supernatural attempt (Gen 32), He gains Jacob's attention. Unwillingly Jacob submits and will hold on to God no matter what! No pain would any more be a barrier or hindrance to him approaching God. Pain had been the highway for God into Jacob's heart. This is how God enters the hearts of many. In prayer I process pain. In prayer I wrestle with God. In prayer I do not let God go until He blesses. In prayer I simply no longer accept bruising but seek blessing. Finally Jacob was persistent in his faith, he held on to God. He refused to release God despite the tremendous pain he was in. God is looking for persistent faith. This is demonstrated on my knees, even when they are bruised. Then bruising will lead to blessing. "I do not let God go until He blesses. In prayer I simply no longer accept bruising but seek blessing." Where did you get your "revelation" that "Unwillingly Jacob submits and will hold on to God no matter what! No pain would any more be a barrier or hindrance to him approaching God."? Paul wrote in 1 Corinthians 4:6 "not to think beyond what is written". So how did you come to this conclusion?